Members demand contract parity: dollar for dollar and date for date! Tired of being treated like second class citizens, 199SEIU nursing home workers in New York and New Jersey are bringing fire to contract negotiations and demanding equal treatment for the work they do. 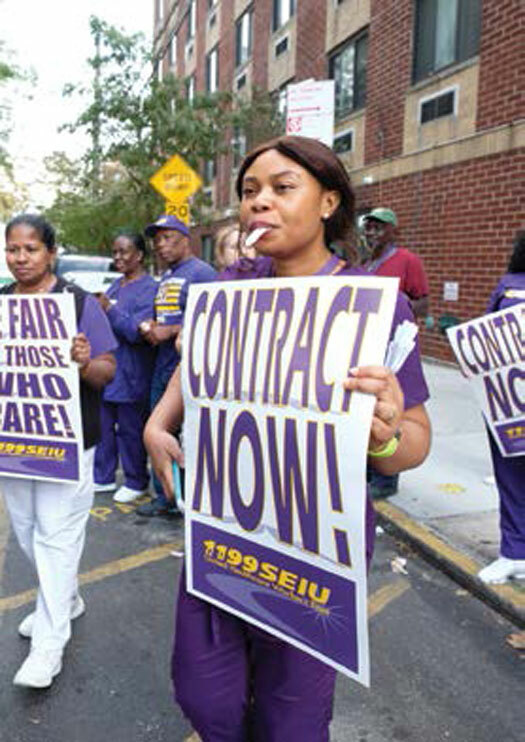 This summer, 1199SEIU longterm care members kicked off contract negotiations with two employer associations, the Greater New York Health Care Facilities Association (GNY) and the Group of 64. The two trade associations represent approximately 185 non-profit and for-profit long-term care institutions through throughout New York City, Long Island, Westchester and the Lower Hudson Valley. Talks with Group and GNY commenced in August, on the heels of 1199’s July settlement with the League of Voluntary Hospitals and Nursing Homes. The League contract provides three 3% wage increases and secures pensions and no-cost health benefits for 40,000 hospital and nursing home workers in the Greater New York Metropolitan area. The 30,000 long-term care workers at Group and GNY facilities took notice and made clear their intention to secure an agreement that reflective of the League contract standards. Bosses immediately pushed back and demanded changes in health benefits, refused to respond to wage proposals and made clear their intention not to move on staffing issues. “Our biggest challenges are wages, benefits and staffing. We also have an issue with agency workers. It’s gotten so much worse. I started doing this work in my twenties and it was never like this. We really have had to fight to win the changes we need,” said CNA Audrey Stokes, a negotiating committee member from Palm Gardens Nursing Home in Brooklyn. Negotiating committee member Doreen Hannigan, an LPN at Smithtown Rehab on Long Island, says in her 41 years as a caregiver she’s never seen such desperate staffing conditions. “Staffing is so critical, and they just walked away from it. Things have become horrendous over the last few years. It’s awful to tell someone they are going to have to work short, because it’s so stressful. We know what it means,” she affirms. Hannigan calls management’s staffing position a slap in the face to workers and patients. Workers are clear that they aren’t asking for special treatment, just what they need to provide patient care: a fair wage, secure health care and safe staffing. “They don’t understand how physically demanding our job is,” says GNY negotiating committee member David Melchionne-Martine Martinez, a Certified Occupational Therapy Assistant at Triboro Rehab in the Bronx. Management’s response so far has been to punt, saying they can’t discuss wages or benefits until they receive funding from New York State’s budget settlement. Workers call that a red herring, pointing out that it was thousands of 1199SEIU members we travelled to Albany on a snowy March day to secure those resources for tightfisted owners. Furious workers aren’t backing down. On Oct. 10, thousands of workers at over 100 GNY facilities held raucous informational pickets to pressure management and inform the public about what’s happening inside their institutions. At press time, GNY workers were back at the bargaining table with management. And they were united in holding the line.